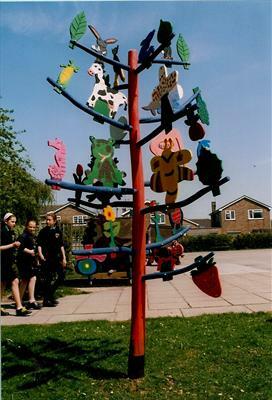 Made with children of Longwick C of E Combined School, Longwick, near Thame. They designed the templates from which the plywood shapes were made, I cut them out, then the children carved surface designs on the plywood and painted all the shapes. I attached these to the 'tree' which I built in my workshop before installing the sculpture in the school grounds. I spent a week working with children on the designs for the plywood shapes, teaching them all how to use a V tool to carve the incised designs onto their shapes. They also learned how to make the edges smooth with files and sandpaper before applying the waterproof acrylic paint.